Out of all the Monopoly slots games (there are loads of them), this one has been one of the biggest success stories so far. 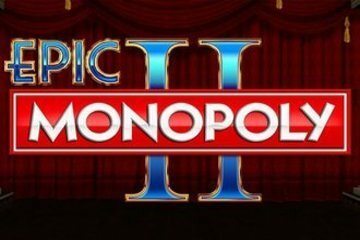 The Epic Monopoly II slot game is built in the same style as the Colossal Reels games, by WMS, which means it is like Spartacus and Lil Red in playing style, but much cuter. Epic Monopoly II is a Scientific Games slot machine that uses Colossal Reels with two reel sets and 100 pay-lines. The branded title is fully based on the Monopoly game with Rich Uncle Pennybags, his dog, a rich female and male making an appearance and awarding high-value prizes. The game benefits from cloning stacks of Wilds and loads of bonus features awarded by the Epic Wheel Bonus feature. Whenever a full stack of Wilds land on any of the reels on the left side, it will be transferred to cover a corresponding reel on the Colossal Reel set thus helping you form multiple winning combinations. The Bonus symbols appears only on the reels 1, 3 and 5 on both grids and once you land 3 or more Bonus symbols across both reels sets, the Epic Wheel Bonus is unlocked. You can win a prize of 500x bet per 2 lines, up to 20 free spins, up to 10 dice rolls for the Around the Board Bonus, Epic Chance Bonus or 2x and Spin Again. During the Around the Board Bonus feature, you can win as much as 1,500x your total bet while the maximum possible amount in the game is 250,000 coins. Epic Wild and Rich Uncle award 250 coins for a five of a kind combo each while 6 Bonus symbols earn you 5,000 coins. Epic Monopoly II is one of the pokies Australian and New Zealand players can enjoy with all its rewarding bonus features available. Just like the original Las Vegas version, the UK version of the Scientific Games slot, also referred to as a "fruit machine", will provide players with a highly entertaining gaming experience. The cuteness of the Monopoly slots game begins immediately as soon as you hear the music playing. It is actually addictive to keep spinning the reels so you can hear the music playing as the game plays. Like many slots, the real action occurs when you hit the bonus. It is not easy to hit the bonus, but when you do, it is wonderful and you get a much better chance to win big prizes and even a jackpot sized win is possible. We are proud to bring you a free version of Monopoly to enjoy with no download and no registration necessary to play. As you already know (probably), we operate a 'no spam' policy here, so you will not be annoyed by pop-ups asking for your email address or to try and get you to sign up to an online casino, when all you want is free slots. If you do want to play for cash (you might do), just navigate to our real money slots section and you will find a list of casinos - it's your choice. Like a lot of slots that can be played in Vegas, you can't play this one for cash online unless you live in just one or two privileged countries, like the UK. It's not all doom and gloom, though, because there are lots of very similar games that are just as enjoyable online. This Epic Monopoly II slot machine game is available to play in most Las Vegas casinos, but it might not be there for very long. For some reason, Monopoly games never seem to be around a long time in Las Vegas. I have no idea why that is, but they seem to produce new ones to replace the old ones almost every year. This is really very different from games like Buffalo slots which remain in the casinos for many years, usually until the screens are so faded they can no longer be played. At that stage, the casino usually replaces it with exactly the same machine, but with a newer brighter screen and new buttons to press.